Unravel the Legend of Sleepy Hollow! Help the armadillos battle the evil Constructo Corp! Light the fuse and fire your way through a new exciting puzzle game! Get hours of relaxation and fun! 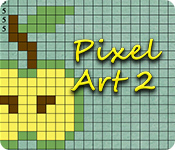 Pixel Art 2 is available for free download. The downloadable version contains sixty minutes of gameplay. If you're one of the millions of players who are already hooked, Sudoku Adventure will challenge you in new ways. This is the ultimate puzzle test featuring 8 different types of puzzles including Sudoku, Kakuro, Crosswords and more! Deploy your fleet, and blow your rivals out of the water in this classic game of navel strategy with lifelike imagery and sound. Climb to the top of the ladder by answering fun questions from the trivia machine! The game features thousands of fun trivia questions in 9 categories. The monkey is back, and he's brought a tuxedo! Experience different game modes, and try to unlock all the special achievements! Dive into Pyramid Pays Slots II! Win big while playing through different game modes and earning special achievements! Explore the mysterious world of Tellus and save the once peaceful planet from a dangerous evil in Battle Slots! Brave the vast ocean and its many challenges in this exciting Slots game! Take on different machines in Slot Quest: Under the Sea! Get a taste of the orient in Mystic Palace Slots, an innovative and amazing Slots game! Watch the reels and win big!